I felt like such a typical housewife last night, which completely cracks me up because I have just never seen myself that way. I mean, I guess I do technically stay home all day now (but I’m working all day, I swear!). Annnnd I did cook a steak, potato, and asparagus dinner for my husband and father-in-law. I even set the table and opened a bottle of red wine to go with dinner! This is kind of a big deal because my dining room table hasn’t seen the light of day in several months, as it is almost always entirely covered with camera equipment, props, dishes, and other general food blog stuff. It sure is a good thing that the rest of my house was a total mess so I didn’t get any crazy ideas about my ability to juggle work, life, and a clean house! So after I stepped outside of my comfort zone by making a super traditional American meal last night, I knew I had to spice things up a bit today by taking a traditional steak recipe and internationalizing it. Yep, I’m officially introducing the word “internationalizing” to the blog. Just go with it. I’m pretty much the luckiest person on the planet right now because Certified Angus Beef® Brand was kind enough to supply me with some seriously incredible steaks this week. Last night I made filet which came out so juicy and tender it made me wish my mother-in-law was there so she could see how well I am taking care of her son. Not that she doesn’t already know it, but a wife has to show off every once in a while, right? Today I decided to make a Vietnamese-inspired pan-seared strip steak by marinating the beef in a mixture of crushed garlic, brown sugar, oyster sauce, fish sauce, sesame oil, and low-sodium soy sauce. While the filet I made last night came out perfect with only salt and pepper as seasonings, I had to give in to my inner sauce-junkie and marinate the strip steaks. The brown sugar in the marinade helped caramelize the sear on the steaks, which is pretty much all a girl like me could ask for in life. The Certified Angus Beef® Brand website has a TON of really good recipes on there, and as someone who has been known to habitually overcook her steaks, I thought it would be best if I took some technique instruction from the masters. I found this great recipe for pan-searing steak, then made it my own by adding a Vietnamese flavor profile. I don’t think I’ll ever cook steak any other way! One of the things I love about Certified Angus Beef® Brand is the quality of the marbling in the steaks. The fat marbling melts while the steaks are cooking, essentially basting the meat from the inside and producing a consistently delicious and juicy steak. Knowing that I can nail a steak dinner every time means I will be loading my shopping cart with this stuff in the very near future! Place the strip steaks in a resealable plastic baggie. Combine the crushed garlic, brown sugar, oyster sauce, fish sauce, sesame oil, and low sodium soy sauce in a small bowl. Stir well, then pour into the plastic baggie. Press out the air and seal the bag tight. Let the meat sit on the counter for 30 minutes or until it comes to room temperature. Preheat your oven to 450 degrees Fahrenheit and place a cast iron skillet inside. Open your windows and turn on the fan for ventilation. Once the oven is preheated, carefully transfer the hot pan to a stove-top burner and set the heat to medium. Place the marinated steaks in the pan and let sear for 2 minutes. Flip the steaks and turn off the stove-top heat. Return the pan to the oven, and let cook for 4 to 6 minutes, until steaks reach desired done-ness. Let rest for 5 to 10 minutes before serving. 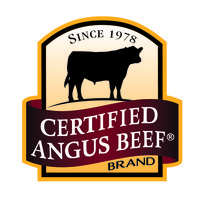 You can also look on their website to see where you can buy Certified Angus Beef® Brand products! Check out Certified Angus Beef® Brand on Social Media to get recipe inspiration and share your own experiences! This is a sponsored conversation written by me on behalf of Certified Angus Beef via Burst Media. The opinions and text are all mine. I love steaks, this recipe sound nice, Pinned!